Whether you're making sub sandwiches or hot pasta family-pleasers, Mastering the Meatball is a must! Here's how. Shape into 48 meatballs, each about 1 inch in diameter. Place in 15x10x1-inch baking pan. Bake 20 min. or until cooked through. Bake meatballs as directed; cool. Pack loosely in large freezer-weight resealable plastic bags. 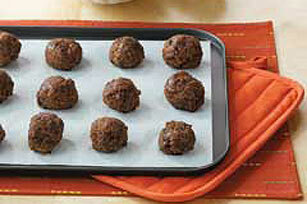 Place in freezer with bags laying flat so that meatballs will freeze individually. Store in freezer up to 2 months. Thaw in the refrigerator several hours or overnight. Prepare as directed, substituting 4 pouches (1 cup each) thawed frozen BOCA Ground Crumbles for the ground beef. Reduce baking time to 10 to 12 min. or until "meatballs" are heated through. Makes 4 doz. or 12 servings, four meatballs each.